Holding page for information operated by the Marineflieger - the Naval Air Service. High wing cantilever monoplane. Wing in three sections with centre-section attached direct to hull. Tubular spar structure with metal and fabric covering. Short single-step hill with shallow Vee bottom and straight sides. All-metal stressed skin rectangular booms attached to roots of centre-section support the tail. All-metal stabilising floats under outer wings. Monoplane tailplane between booms. Each boom terminates in a fin and rudder. All-metal structure with fabric-covered movable surfaces. Three Junkers Jumo 205C twelve-cylinder diesel engines rated at 880 hp for take off, one mounted in a nacelle above the centre-line of the wing and two in nacelles at extremities of the centre-section and in line with tail booms. Three-bladed controllable pitch airscrews to outer engines, four-bladed airscrew to centre section. Fuel carried in tubular spar of centre-section. Mooring compartment in nose. Then follows a gunner’s position with gun turret. Pilot’s compartment in front of leading edge of wing with wireless and navigation positions in hull below wings. Gunner’s position with gun turret at rear of the hull. One 20mm MG201 with 330 rounds of ammunition located in the forward gun turret, one 20mm MG201 with 220 rounds of ammunition located in the rear gun turret. Shackles under the wing for up to four 100 kg bombs, four depth charges or two sea mines. Span 27 metres; length 22 metres; wing area 112 square metres. Normal flying weight 15,480 kg. Maximum take-off weight 16,480 kg. Maximum take-off weight for catapult launch 18,160 kg. Maximum speed at sea level 272 kph; cruising speed 220 kph. Climb to 3,000 metres 24 minutes. Range with maximum fuel 3,200 kilometers. Low-wing semi-cantilever monoplane. Wings have straight leading edges, slightly swept-forward to trailing edges and rounded tips. They are attached to the lower fuselage longerons and are braced for about one-third of the half-span by inverted Vee struts from the floats. Fuselage is a welded steel tube structure. The front part of the fuselage, which is circular, is covered with a stressed metal skin; the rear part, which is oval, is fabric covered. Cantilever monoplane type tail unit with fin located in front of the tailplane. Statically and aerodynamically balanced rudder and one piece elevator. All metal structure with metal covered tailplane and fin and fabric covered rudder and elevator. Trimming tabs in elevator adjustable in the air; tab in rudder adjustable on the ground only. Twin long single-step floats attached to the fuselage by a system of streamlined steel tube struts in the form of an inverted “W” when viewed from the front. Main side struts are cross-braced in the fore-and-aft plane. Floats provided with catapult points. Water rudders. One 900 hp BMW 132K nine-cylinder radial air cooled engine with supercharged and fuel injection pump, driving a three-bladed variable pitch airscrew. NACA cowling. Two fuel tanks totaling 900 litres – one in the fuselage and one in the starboard float. Pilot and wireless air gunner in tandem cockpits under continuous transparent canopy with sliding sections over the cockpits. Two 15mm MG151 machineguns with 300 rounds per gun in the wings and one 7.92mm MG17 with 225 rounds in the cowling of the fuselage; two 7.92mm MG81 machineguns with 400 rounds per gun on a flexible mount in the rear cockpit. Provision for two 50 kg bombs beneath the wings. Span 12.1 metres, folded 4.8 metres; Length 11 metres; Height 4.4 metres. Wing area 28.4 square metres. Empty weight 2,990 kg; loaded weight 3,730 kg. Maximum speed 310 kph at 4,000 metres. Initial rate of climb 300 metres per minute. Service ceiling 7,000 metres. Range 1,070 kilometres at 253 kph. In May 1940 the German Kriegsmarine announced that it had adopted the Accrisius Avenger/ENAER Alicanto dive and torpedo bomber to succeed the venerable Fieseler Fi167 as the principal strike aircraft of the re-emergent Marineflieger. A production was acquired, together with tooling and several complete aircraft to serve as patterns. The Fieseler firm, with its experience in the manufacture of carrier-based aircraft, was assigned the task of manufacturing the aircraft for the Kriegsmarine, under the designation Fi168 “Hammerhaie” (Hammerhead Shark). Low-mid inverted gull wing cantilever monoplane. Inner portion of each wing set at anhedral for approximately twenty percent of half span, remainder at fairly coarse dihedral. Outer wings fold upward for stowage. All metal structure with flush riveted stressed metal skin. Ailerons on outer folding section, flaps inboard of ailerons to fuselage. Oval all metal semi-monocoque fuselage with flush riveted stressed skin. Cantilever type monoplane type tail unit. All metal framework with metal covered fixed surfaces and metal frame and skin elevators and rudder. Controllable trim tabs in all control surfaces. Retractable type undercarriage. Oleo shock absorber struts hinged at the wing knuckles and are raised inwardly into the underside of the wings. Fully retractable tail wheel. One BMW 801G fourteen-cylinder two-row radial air-cooled geared and supercharged engine in low-drag cowling with induced fan cooling, rated at 1,900hp for takeoff and 1,700hp at 5,000 metres. Four-blade VDM type constant speed airscrew. Fuel tanks located in the wings. Cockpit seats two in tandem under transparent canopy. Armoured windscreen and cockpit armour plating provided. Two 20mm MG201 cannon with 60 rounds per gun in each wing outside the airscrew disc. One flexible 13mm MG131 machinegun with 400 rounds located in the rear cockpit. Provision for carrying one 880 kg torpedo or armour-piercing bomb of the same weight, or combination of smaller bombs to a maximum of 500 kg for dive-bombing. Span 14.4 metres, length 11.5 metres, height 4.06 metres, wing area 35.39 square metres. Empty weight 3,100 kg, normal loaded weight 4,900 kg, maximum overload weight 5,360 kg. Maximum speed 560kph at 6,000 metres, cruising speed 368kph at 4,000 metres, landing speed 120 kph. Climb to 4,000 metres 7.5 minutes. Range 1,920 kilometres at normal cruising speed. The Focke Wulf Fw190M was derived from the land-based Fw190A fighter to meet immediate Marineflieger requirements for a replacement for the fragile Bf109T. The first pre-production aircraft appeared in the summer of 1941 with full-scale production commencing in the autumn of that year. Low wing cantilever monoplane. Wing in one piece, the front spar being continuous and passing through the fuselage, to which it is attached at three points – two on the upper flange and one on the lower. The rear spar is in two sections, the roots being attached to the sides of the fuselage by normal pin joints. Two spar wing structure with widely-spaced flange plate former ribs, span-wise Z-section stringers and a stressed metal skin. The spars are built up of flanged plates which, inboard from the ailerons, are reinforced by L-section extrusions and progressively thickened end caps to form I-section members. Outboard of ailerons the spars have single integral flanges. The front spar from the points of attachment of the undercarriage to the upper attachments to the fuselage is cranked inward, the undercarriage when retracted lying ahead of the front spar. The gun and undercarriage bays have specially strengthened ribs. Metal framed, fabric covered ailerons. Electrically operated all metal split trailing-edge flaps between ailerons and fuselage. Fuselage is an all-metal monocoque structure built-up of bulkheads, flanged formers, Z-section stringers and a smooth stressed skin covering. The front inverted U-shaped bulkhead attaches to the upper flange of the front spar and on the front face of the bulkhead and spar are five attachment points for the engine mounting – three on the spar and two on the bulkhead. All other bulkheads and frames conform to the cross-section of the fuselage. The extreme rear section is integral with the fin and is detachable from the main structure. Large detachable panel in the underside of the fuselage extending from the engine bay to rear of cockpit for installation and removal of fuel tanks. Cantilever monoplane type tail unit. Fin integral with the rear fuselage. Electrically operated adjustable single-spar tailplane and fin and fabric covered control surfaces. Fixed perforated trim tabs in rudder and elevators. Fin-rear fuselage assembly houses the electric tailplane incidence gear and spring for lowering the tail wheel. Arresting hook fitted beneath the fuselage and catapult spool fitted. Retractable type undercarriage. Main cantilever oleo-legs are hinged ahead of the front spar and retract inwardly, fairing plates on legs and wheels and on the undersurface of the wings closing the apertures when the wheels are raised. Electrical retraction. The tail wheel is also partially retracted by a cable connected to the starboard oleo-leg. Tail wheel has spring centering and centre-lock, the latter operating when the control column is pulled hard back. One BMW 801E fourteen-cylinder two-row radial air-cooled geared and supercharged engine in low-drag cowling with induced fan cooling, rated at 1,800 hp for takeoff and 2,150 hp with MW50 boost at altitude. The whole engine unit, complete with oil coolers, is attached to the front bulkhead and spar by five bolts. Protected fuel tanks beneath the cockpit floor. Oil tank (42 litres) in fuselage. Reverse flow oil coolers in armoured annual ring which forms the cowl leading edge. VDM airscrew with electric pitch change and metal blades. Pilot’s cockpit over trailing edge of wing with clear view canopy and tail fairing, the whole of which slides aft to give access to the cockpit and which may be jettisoned complete in an emergency. Pilot’s seat is armoured and is further backed by an armoured bulkhead and headrest, the latter forming part of the jettisonable cockpit canopy. Bullet proof windscreen. The wireless aerial lead is in the roof the canopy. The canopy cannot be opened in the air except to be jettisoned. Armament comprises two 13mm MG131 with 220 rounds of ammunition in the forward fuselage decking and two 20mm MG201 with 150 rounds of ammunition per gun , located in the wing roots and synchronised to fire through the propeller arc. Attachment points in the outer wing panels for two 100 kg bombs; attachment point beneath the centre fuselage for one 120-litre jettisonable auxiliary fuel tank. Wing span 10.5 metres; length 8.84 metres; height 3,96 metres. Wing area 18.3 metres. Take-off weight with armament and normal fuel 4,480 kg; maximum permissible take-off weight 5,000 kg. Maximum speed without MW boost 640 kph at 5,500 metres; with MW boost 650 kph at 6,300 metres. Climb to 10,000 metres without MW boost 26.5 minutes, with MW boost 16.5 minutes. Service ceiling 10,300/11,400 metres. Cruising range with normal fuel 1,520 km at 477 kph at 7,000 metres. Endurance 3 hours 20 minutes. Low wing cantilever monoplane. Constant taper from roots to tips, with most taper on trailing edges. Wing in three main sections, comprising a wide centre-section with flat upper surface and two outer sections with dihedral on upper surfaces and detachable tips. All metal structure with one main and two auxiliary spars, former ribs and a smooth metal skin. Metal-framed fabric-covered Frise type ailerons with both fixed and controllable trim tabs. All-metal Fowler type flaps on centre section. Oval section all-metal monocoque fuselage with flush-riveted smooth metal skin. Cantilever monoplane type tail unit. All metal tailplane and fin, metal framed fabric-covered elevators and rudders. Controllable trim tabs in all control surfaces. Retractable type undercarriage. Main wheels raised backwards into engine nacelles. Retractable tail wheel. Two Bayerische Motoren Werke 801D radial air-cooled engines rated at 1,820 hp for takeoff; 1,650 hp at 2,000 metres; 1,440 hp at 5,700 metres. Self-sealing fuel tanks in wings and fuselage; oil tanks in engine nacelles. The crew of three is seated beneath a continuous canopy with sliding sections. The pilot is seated in the fore part of the cockpit, and behind him sits the navigator/observer; the wireless operator/air gunner occupies the rear position. Oxygen equipment fitted. Defensive armament comprises two fixed 15mm MG151 machineguns with 300 rounds per gun located in the forward fuselage and one flexible 15mm MG151 machinegun with 400 rounds located in the rear of the cockpit. Internal bomb cell for up to 1,000 kg of bombs; additional ordnance up to 500 kg can be carried on hard points beneath the wing centre-section. Alternative, one torpedo can be carried externally. Length 26.0 metres; wingspan 34.7 metres; height 8.0 metres; wing area 122 square metres; Empty weight 15,900 kg; Maximum takeoff weight 29,000 kg. Maximum speed 515 kph; maximum cruising speed 286 kph. Range 4,800 kilometres on internal fuel. Four 20mm MG151 with 200 rounds per gun in the wings; underwing ordnance including torpedoes, bombs and rocket projectiles to a maximum of 1,900 kg. Presently under development; first flight projected for the autumn of 1945 or winter 1945/46. 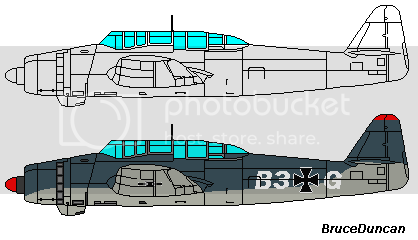 Intended to replace the Fi168 "Haifisch" dive and torpedo bomber in service with the Marineflieger.